Your toddler may continue to have diaper rashes until she stops wearing diapers. These are usually not serious and they often go away on their own. In most cases, your toddler can continue eating her normal diet unless her diaper rash is caused by a food sensitivity or an illness. 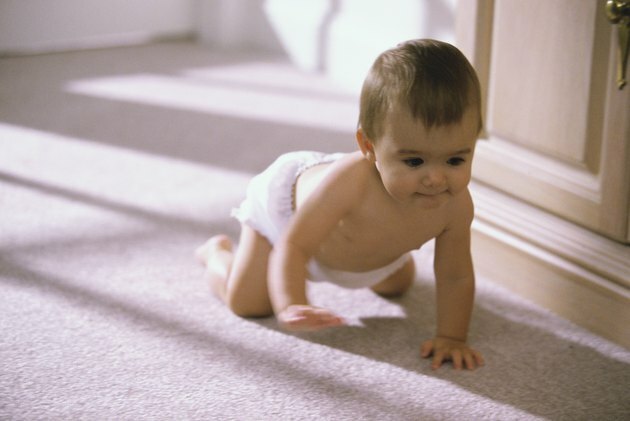 Diaper rash is caused by rubbing, prolonged exposure to a wet diaper or diarrhea. Toddlers are prone to diaper rash from diarrhea because they are eating a variety of foods. Some toddlers have sensitivities or allergies to certain foods, which can lead to diarrhea and then a diaper rash. Add in the fact that toddlers are prone to touch everything they see, and you have a recipe for diarrhea caused by infection as well. A variety of viruses and bacteria can cause diarrhea, such as gastroenteritis or rotovirus. The treatment for diaper rash depends on the cause of the rash. If your toddler's rash is caused by chafing from the diaper, diaper cream will usually take care of the problem. If the diaper rash is caused by diarrhea, determine the cause of the diarrhea. If your toddler has diarrhea following the consumption of a certain food, ask your pediatrician if you should reduce or eliminate the consumption of that food. If you suspect that your toddler is ill, the pediatrician can determine if medication is necessary or if a special diet will be enough to halt the diarrhea. The traditional way to halt diarrhea, and therefore diaper rash caused by diarrhea, is the BRAT diet. Brat stands for bread, rice, applesauce and toast. In addition to these staples, you can feed your toddler pasta, soft-boiled eggs, yogurt with probiotics, grains and cereals. This starchy diet is easy to digest and adds bulk to the stool, which can help the diarrhea to dry up. Avoid giving your child fats, sugars or fruit juice, as these can exacerbate the diarrhea. Consult your pediatrician if your toddler's diaper rash develops blisters or a raised or dotted pattern. This might indicate that she has a yeast infection or a bacterial infection such as impetigo. If your toddler has diarrhea, call the pediatrician right away if your toddler is exhibiting symptoms of dehydration such as no urine in more than 12 hours, inability to make tears or a dry mouth. Contact the pediatrician immediately if your child appears to be very ill, if blood appears in her diarrhea, or if he has more than eight bouts of diarrhea in eight hours.